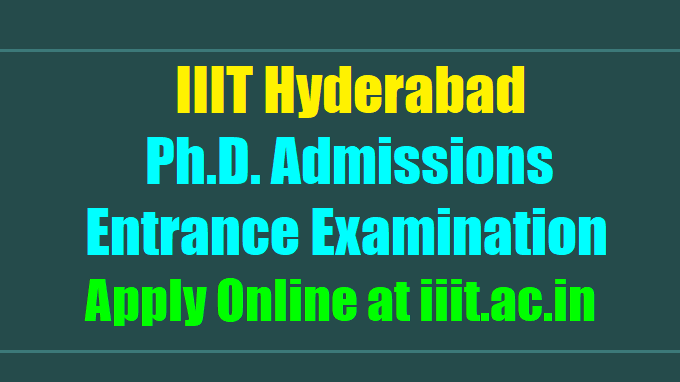 Registrations for IIIT Hyderabad begin, apply now on iiit.ac.in/IIIT Hyderabad PhD admissions 2018, Apply before November 25 at iiit.ac.in: The International Institute of Information Technology (IIIT) Hyderabad has called for admissions to PhD programmes for Spring 2018. Candidates who wish to apply for the same can do so from the official website of the institute (iiit.ac.in). “Applications are invited from individuals with passion for engaging in cutting edge research and who aim to transform industry and society by developing a new theory, technology or applications,” IIIT Hyderabad said in a notification. Candidates will be required to pay a fee of Rs 2,000 for the application process. The payment can be done through credit card, debit card or net banking. The Indian Institute of Information Technology (IIIT) Hyderabad has released an official notification inviting all the interested, eligible candidates for the Doctorate of Philosophy (PhD) programmes in CSE and ECE. The Indian Institute of Information Technology (IIIT) Hyderabad has released an official notification inviting all the interested, eligible candidates for the Doctorate of Philosophy (PhD) programmes in CSE and ECE. The research will include focus on areas like Computer Vision, Language Technology, Robotics, Computation Natural Science, Algorithm, Security, VLSI, AI/ML, Data Analytics, and Wireless Communication like co-operative communication, next generation wireless communication and information flow networks. "The PhD programmes in ECE and CSE is ideal for research-oriented individuals who've been in the industry for 3-4 years, those who want to pursue higher studies, feel that a productive technical career in the industry needs more specialisation, or even those who after a few years in the industry have realised that research is what they really want to do," said Professor and Director P J Narayan of IIIT Hyderabad. All the candidates interested in applying for the same need to possess a degree in Bachelor of Technology (BTech)/Bachelor of Engineering or Masters in Technology (MTech)/Master of Engineering/Master of Computer Applications (MCA) in Electronics/Electrical/Computer Science/Computer Engineering with an excellent academic record from a recognised institute or university. Further, candidates need to have an interest in making advancements in the industry and society with the help of new theories and applications. – Candidates must have completed a BTech/BE or MTech/ME/MCA in electronics/ electrical/ computer science/ computer engineering with an excellent academic record. – Candidates with good quality research publications will be encouraged. – Candidates who have participated in research-oriented projects will be preferred. – Those with work experience in R&D labs will be preferred. The selection process will include a written entrance exam and an interview round. For the interview, candidates who hold a good track record will qualify directly. Candidates need to apply online at iiit.ac.in. Step 1: Go to the official website of IIIT Hyderabad as mentioned above. Step 2: Click on the link for the PhD admissions. Step 3: Read the instructions provided carefully and click on the link provided that says “click here to apply”. Step 6: Download your application and take a print out of the same for further reference.